For a half century if not longer, the central valleys of the state of Oaxaca have been known in the US, Canada and further abroad for production of the high-alcohol-content, agave-based spirit, mezcal. The region’s pre-Hispanic ruins, colonial architecture, cuisine and craft villages have been noted in travelogues and guide books for some time. More recently even beach lovers visiting Huatulco and Puerto Escondido have elected to take in a bit of culture by spending a couple of days in the state capital. The iconic Mexican drink has now taken center stage, and hence the arrival of mezcal tourism. It has gripped Oaxaca; and along with it has come a revival of the chango mezcalero. Chango mezcalero is a clay receptacle in the shape of a monkey, generally a liter in size or smaller. Traditionally, and arguably dating back to the mid-1800s, it was used as a bottle to market and sell mezcal. It was a natural, since the primate has been associated with drunkenness for eons. In the second of three articles authored by this writer, its history was dated to the 1930s based on uncovering a chango mold dated July 12, 1938, owned by the late Juventino Nieto of the Oaxacan town of San Bartolo Coyotepec. In a cardboard box alongside it was a somewhat larger undated chango mold of the same vintage. Don Juventino was the husband of the late Doña Rosa Real of black pottery fame. However, an alternate theory of the inventor of the chango, from the same village, has been put forward by members of his family. For the past couple of decades, and likely longer, vintage chango mezcaleros have become highly collectible, mainly by Americans interested in Mexican folk art, non-human primate imagery, or mezcal and its associated appurtenances. 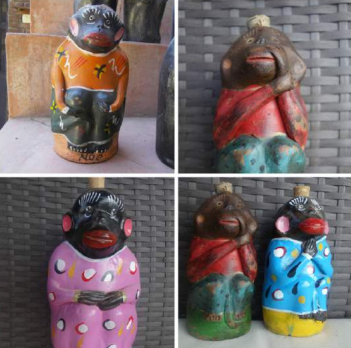 “Old” clay monkey bottles are available on ebay, and on other websites specializing in the purchase and sale of vintage Mexicana and what are otherwise known as “smalls” from Mexico and the southwest US. Prices can be as low as $50 and as high as $500 USD. It’s very difficult to discern whether or not a chango mezcalero was indeed made in the 1940s or earlier, as some are represented. Antique dealers and aficionados know best how to date collectibles. Most in the general public, however, do not have a clue, and if it looks old to them, it is. There are currently at least three pottery workshops in the town of Santiago Matatlán which have been producing chango mezcaleros for decades, and continuing to date. Matatlán is known as the world capital of mezcal, boasting the globe’s highest number of artisanal (and at least somewhat industrialized if not more so) small family-owned and operated distilleries, or palenques, as the traditional ones are locally known. Some of these contemporary changos are upright, others are sitting on a log, and all are formed with the monkey in different poses. Until recently, if the changos were painted, and most of the time they were, they were glossy. The older ones, both tucked away gathering dust in the back of a palenque, and in local purchasers’ homes having been used, often show nice wear. As of early 2016, or thereabouts, vintage-looking changos have begun to appear in the marketplace in Oaxaca. They have been spotted in at least one antique shop and one mezcalería. The coloring and patina is matte, and exquisite. There are at least two sizes. Most likely they are coming from the same workshop, using the same or similar molds as the shiny bottles, as is easily borne out by anyone who places the old and the new vintage side by side. Alvin Starkman operates Mezcal Educational Excursions of Oaxaca (http://www.mezcaleducationaltours.com). Alvin has a substantial collection of both contemporary and vintage changos. Alvin’s first visit to Oaxaca was in 1969. He has been a permanent resident since 2004.